Many people I know who aren’t “into” yoga (as in don’t attend a studio of their own volition) have, on occasion, practiced yoga at home. Maybe they haven’t created their own practice, but they will follow a video or online tutorial sooner than they will be seen with a community of yogis. I’ve been practicing yoga for more than eight years and I am quite the opposite. And that fact has always been a bit of a conundrum to me. How can I be so regimented when it comes to making it to a class at 6 am every Monday morning, or speeding across town on my bike to make it to one at 5:30 pm during rush hour traffic, but I can’t roll out my mat on my own to save my life? I’m nowhere near a regular solo practitioner, but this past winter forced me to figure out how to incorporate some of that yoga regimen into my “personal” life. It didn’t come about for the reasons it probably should have (i.e. wanting to do some deeper soul searching, having a greater desire to meditate longer, exploring what yoga means to me in a more personal way, etc. ), but it did happen, so I guess sub-zero temperatures have given me something to be thankful for. In case you’re wondering what an at-home yoga practice might be like, here’s some comforting news: Anything and everything is yoga. As long as you’re moving and breathing with intention, you’re doing it. If you’re drawing your mind away from daily life distractions to focus on the present moment, you’re a yogi. So whether you’ve taken hundreds of classes in a studio or you’d need a demonstration to be able to do Downward Facing Dog, you’re entitled to and can absolutely benefit from an at-home practice. The first thing you have to do is simply roll out a mat. No joke, this is sometimes half of my struggle. I’ll be on the way home from work, having every intention to turn on some music and flow by myself for a solid hour. But when I walk in the door, I have a snack, chat with roommates, think of some emails I need to send, remember I need to pick up dry cleaning and then think about how good of a workout a class starting in 30 minutes would be … and then I’ve lost the desire to practice altogether. But if I can manage to just roll out my mat, I know I’m more likely to follow through. The second thing to remember is to have some fun. I’ve done some pretty rigorous sequences at home since starting this practice, namely the Ashtanga Primary Series, and while I do appreciate the meticulousness that set series require (they are definitely a goal to strive towards and a tough workout, NOT an easy accomplishment), I’m not wedded to any of them. There can be so much joy in listening to your body, and moving (or not moving) the way it’s asking you to. The third thing to remember that always helps me with my practice is that it’s 90 percent mental. Doing yoga at home is one of the best times for me to focus on that. It lets me get something totally different out of my “class” than I would if I were in a studio. No matter how focused I can be mentally with a community around me, I no doubt let my mind wander to what my neighbor is doing, or come up with stories in my head about why an instructor is teaching what he is, or judging someone in the back of the room for talking during savasana. When I’m home alone, my mind sometimes starts to drift towards what I need to do right after I’m done, but because it’s just me and my thoughts, I’m quicker to notice and to bring them back to my mat with intention. 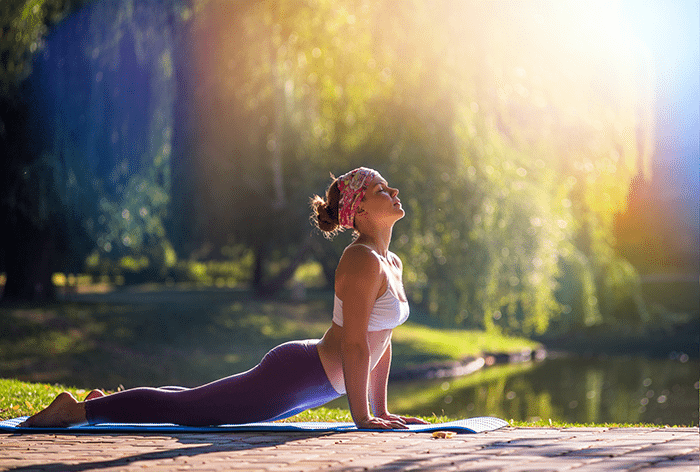 The beauty of yoga, anywhere you do it, is that it can look, feel, and mean something different for everyone. Your goal from the time on your mat is different than mine. You might meditate and someone else might not care one bit about that; they might want to put on a jamming playlist and practice handstands. And truthfully, it doesn’t matter. Which leads me to the fourth and final reminder: Don’t get discouraged. Don’t set up expectations in such a way that you end up feeling let down by your capability to lead your own practice. It’s just like any workout you do; some are better than others. But I honestly believe there is something to be learned from every time I step onto my mat, and it’s just up to me to figure out what that is. The most important reminder I have to give myself is to stay open to the opportunities my mat presents. If you’re interested in starting to practice more (or for the first time) on your own, above all, don’t take yourself too seriously! A yoga practice is just that- a practice- not an aim at perfection. Wait, GMOs are Safe Now?